Simply put, a metal workshop is a place to get stuff done. 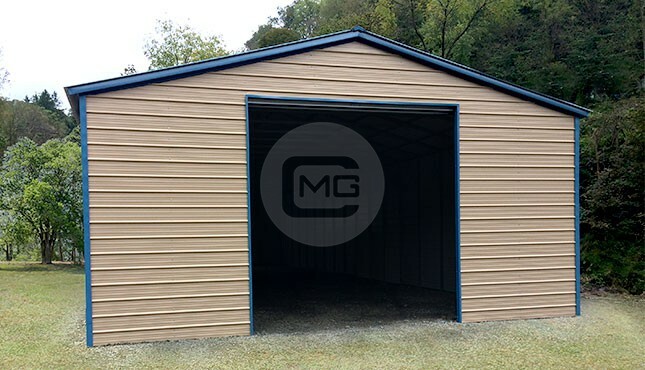 Whether you need an enclosed outbuilding behind your house for tinkering on your classic car, or whether you require a 100’-long commercial manufacturing facility, Metal Garage Central has a solution for you! 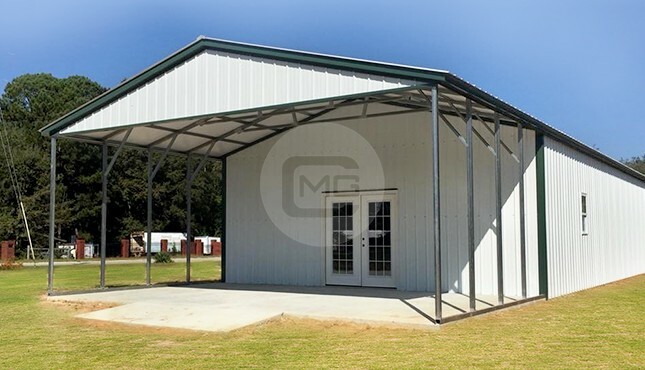 We have an excellent selection of clear span metal building design options for you to choose from to help you create your own custom steel workshop. Metal is easier to clean and requires less maintenance than stick-builds or other structures. This is especially important for a workshop facility that gets regular use. And since the color is infused into the metal, you don’t have the same peeling or fading paint issues that you get with wood, either. Steel buildings don’t rot like wood and can stand up to constant use and extreme weather, including high winds, heavy rains, accumulating snow, lightning … and are better at withstanding earthquakes, too! The metal paneling can also be coated with aluminum compounds to help further prevent rusting and prolong the life of the panels. Steel isn’t susceptible to termites or other pests, and doesn’t harbor mold or mildew. Steel is also incredibly fire resistant; if you work with flammables in your workshop, this is a nice feature to keep in mind! The versatility of steel allows for more complex architectural designs and more clear-span interior space. It’s easier to expand your metal workshop building as your space needs grow, too. Thanks to superior strength, durability, and fire resistance, your insurance costs may decrease if you choose a steel building over other options. That’s another cost benefit you get by choosing a metal workshop from Metal Garage Central! One of the first things you need to decide when choosing a custom metal workshop is how you plan to use your structure. You’ll want to consider how much space you’ll need to be able to accommodate your vehicles, equipment, hobby space, warehouse space, manufacturing space, or whatever other uses you might have in mind. When it comes to the potential applications, the sky is the limit with our prefab steel workshops and commercial shop buildings. At Metal Garage Central, our metal workshops can be used in any environment, from residential to commercial to industrial to agricultural applications. One clear advantage of a steel building over wood or other building materials is that the strength of steel framing allows for higher ceilings and more usable interior space. These clear span metal structures can also be assembled and installed in a much shorter time frame than stick builds. 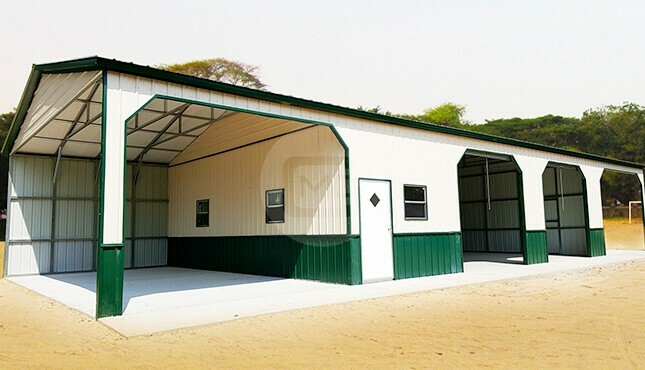 Because our steel workshops feature clear span design with 100% usable interior space, you have the flexibility to customize your workshop any way you like, with different colors, roof styles, roll-up doors, walk-in doors, windows, lean-tos, canopies, and interior dividing walls, among other options. 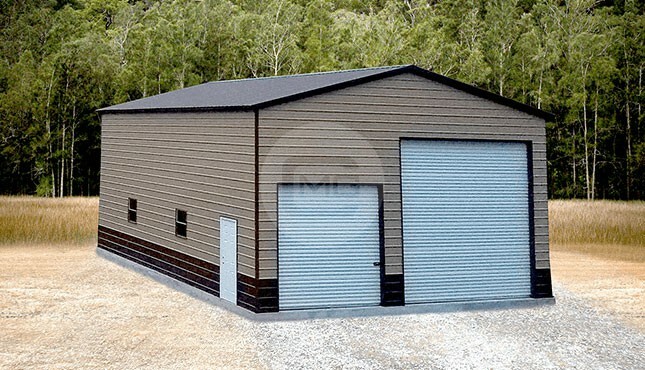 What’s the best size for a metal workshop building? That depends entirely on how you want to use your facility! Some of our customers know exactly what building dimensions they need when they contact us to design a custom metal structure. If you know exactly what you need, we can certainly work with you on that! 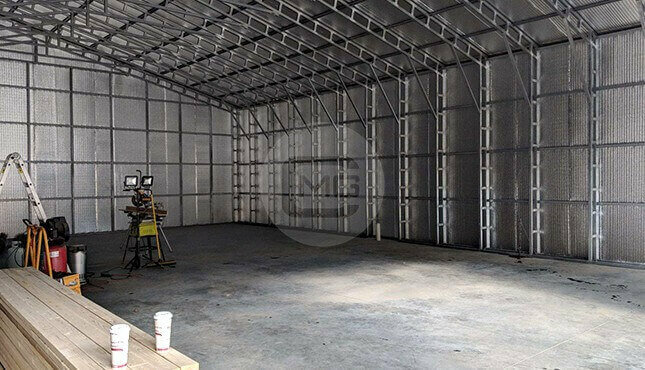 Many times, however, our customers may know which vehicles, equipment, or items they want to house, and they may have an idea of how they want to use their steel workshop, but they are unsure about what size dimensions would be best for their particular needs. If you fall into that category, please reach out to us, we’ll be glad to help! 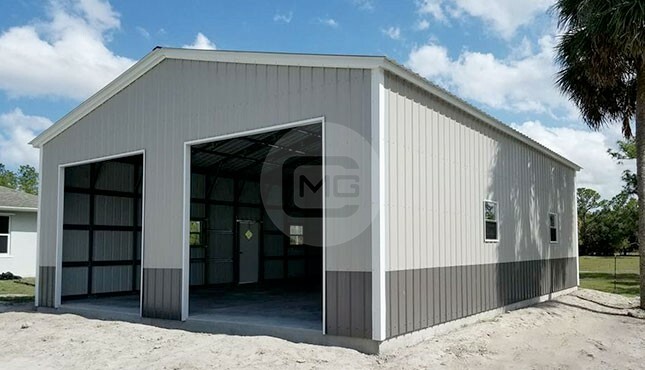 At Metal Garage Central, we take the time to listen to your desired storage needs and intended uses for your new steel structure, and then our building specialists and engineers will work together with you to design the workshop building that will meet both your needs AND your budget. 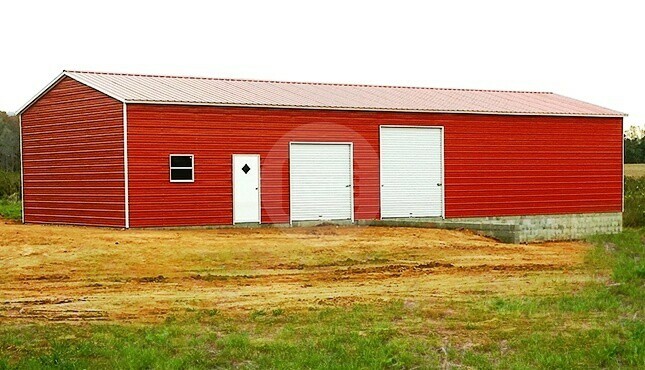 Our workshop buildings typically start at 30’ wide, but we also commonly provide buildings that are 40’, 50’, or 60’ wide. 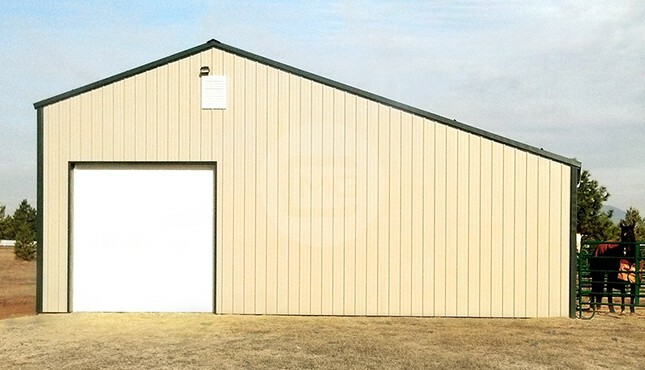 Typical workshop building length ranges anywhere from 40’ to 100’, but we can extend up to 300’ if you need a large commercial facility. 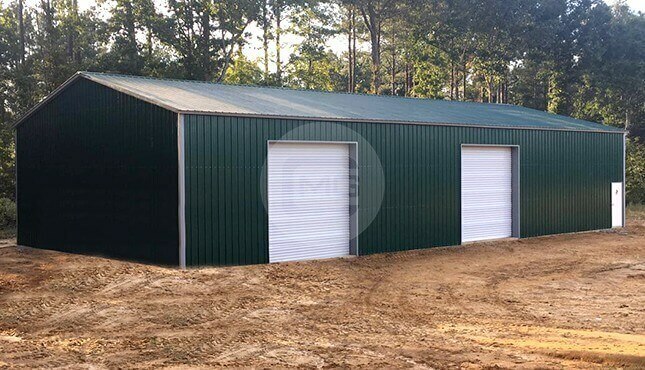 No matter what width, length, or height requirements you may have for your workshop building, we can custom-design and craft a steel structure to meet your exact specifications! Why Choose Metal Garage Central? We know that buying a steel building is a significant investment, and we know you want to make sure you’re getting the right product with the best service, all at a competitive price. Metal Garage Central is the nation’s largest online dealer of metal structures, and we work to ensure that your shopping experience with us is as pleasant and painless as possible! Do you like to do your shopping online? Then take advantage of our cutting-edge 3D Estimator which allows you to easily design and customize your ideal metal structure, all from the comfort of your couch. You can create your building, save your plans, share them on social media, and even complete your order with just a few clicks! Or perhaps you prefer to do business the old-fashioned way, by speaking with an actual human. When you’re ready to talk, we have nearly 30 friendly and knowledgeable building specialists at Metal Garage Central who will take their time to listen to your needs, and can then walk you through every step of the process, from design to fabrication to install. And speaking of delivery and installation … we’re happy to deliver and install any of our custom metal buildings for FREE with your standard purchase! We have great rent-to-own and financing options available, too! 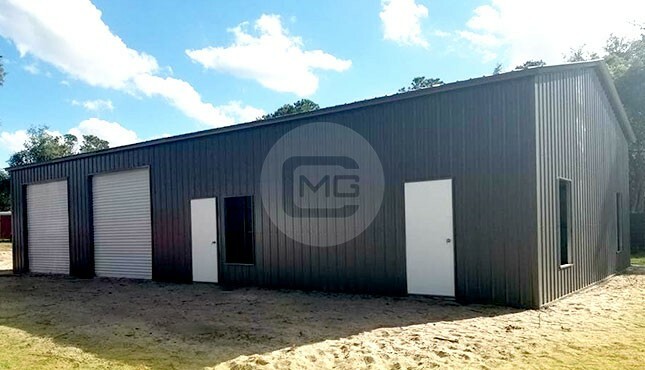 At Metal Garage Central, we’re about much more than just selling you a custom metal workshop building – we’re about Providing Shelter for Your Way of Life. Give us a call today at (980) 321-9898, and see the Metal Garage Central difference for yourself!